Activation of prorenin by the prorenin/renin receptor has been shown to play a role in the development of diabetic nephropathy in rats, but its involvement in renal progression is unknown. Dr. Takahashi and colleagues report that glomerulosclerosis and proteinuria regress in diabetic rats treated with the prorenin receptor blocker, whereas angiotensin-converting enzyme inhibitor treatment simply ameliorates progression. In addition, blockade of the prorenin receptor leads to a reduction in activated prorenin+ glomerular staining and renal angiotensin II levels. If confirmed by other groups, these observations give hope that such agents may one day be added to the treatment armamentarium for diabetes. See Takahashi et al., pages 2054–2061. Angiotensin II contributes to the final acidification of urine through actions on the collecting duct, but how this occurs is unknown. Dr. Rothenberger and colleagues addressed this question using isolated mouse outer medullary collecting duct cells. They report that angiotensin II, signaling predominantly through the AT1 receptor, stimulates vacuolar H+-ATPase activity through a cascade involving small G-proteins, phospholipase C, intracellular Ca2+, protein kinase C isoforms, MAP kinases, and PI3 kinases. The group further shows that the H+-ATPase B1 subunit is required for angiotensin II to exert its effect, the first H+-ATPase isoform-specific function identified in mammals. See Rothenberger et al., pages 2085–2093. 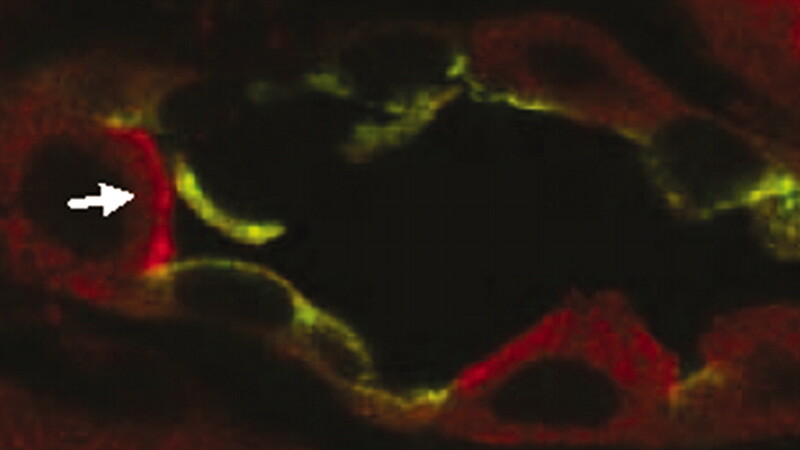 Fibroblast growth factor 23 (FGF23)-null mice are hyperphosphatemic, have elevated 1,25(OH)2D levels, and die at an early age with extensive vascular calcifications. In this study by Dr. Stubbs and colleagues, dietary phosphate restriction completely resolves vascular calcifications and significantly improves survival in FGF23-null mice despite elevated 1,25(OH)2D and serum calcium levels. Conversely, normalization of 1,25(OH)2D and serum calcium by dietary vitamin D restriction also improves survival despite continued hyperphosphatemia and vascular calcification. This report furthers our understanding of mineral metabolism, provides support for aggressive hyperphosphatemia treatment, and suggests that supraphysiologic 1,25(OH)2D levels may have detrimental effects. See Stubbs et al., pages 2116–2124. Human growth hormone reduces inflammation and tips the scales of protein homeostasis toward anabolism, two properties that suggest that human growth hormone may benefit the hemodialysis population. In a randomized placebo-controlled trial, Dr. Feldt-Rasmussen and colleagues report that human growth hormone treatment is safe and leads to a significant increase in lean body mass in adult hemodialysis patients. In addition, this proof of concept study suggests that treatment may decrease cardiovascular risk and improve quality of life. See Feldt-Rasmussen et al., pages 2161–2171. Whereas the contribution of urinary oxalate to the formation of calcium oxalate kidney stones is known, the contribution of dietary oxalate is unknown. Drs. Taylor and Curhan prospectively followed >240,000 subjects in the Health Professionals Follow-Up Study and the Nurses’ Health Studies I and II for a combined 44 years to address this question. Their multivariate analysis suggests that, among men and older women, the association of dietary oxalate and risk of symptomatic nephrolithiasis is modest, with no significant relationship observed in younger women. See Taylor and Curhan, pages 2198–2204. Cognitive impairment is common in the ESRD population, but it is not known whether it begins at earlier stages of chronic kidney disease (CKD). Dr. Hailpern and colleagues analyzed cross-sectional data from the National Health and Nutrition Examination Survey III, which included 4849 ethnically diverse subjects aged 20 to 59 years who had participated in at least one cognitive test. In multivariate models, moderate CKD was associated with poorer performance on tests of visual attention and learning/concentration, but was not significantly associated with visual-motor reaction time. See Hailpern et al., pages 2205–2213.